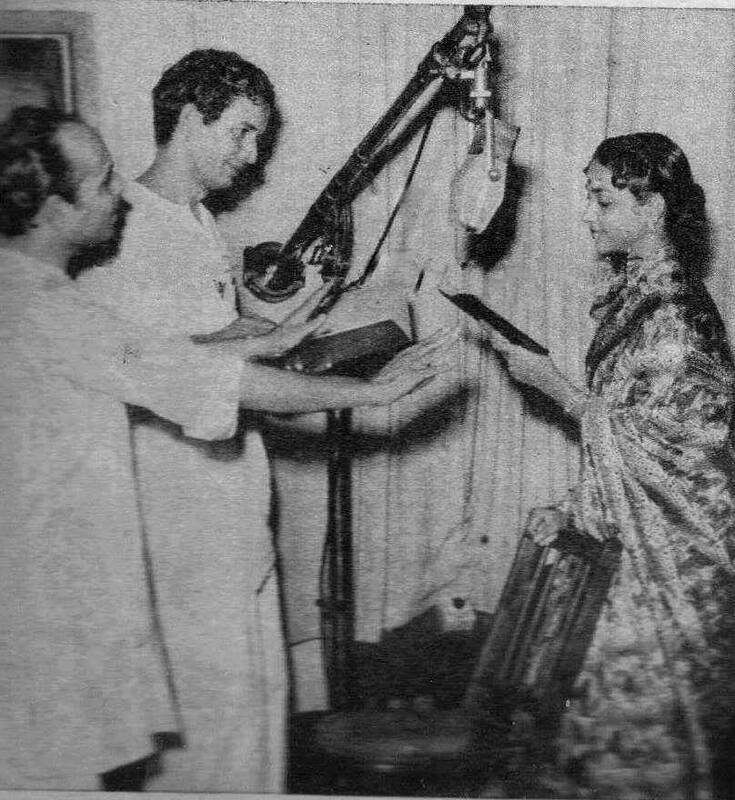 Rarest of the rare composition of Mohd Shafi sahab..
We found this extremely rare photo of composer Mohd Shafi sahab rehearsing/recording a song with Geeta Dutt (nee Roy) ji for Janta Films ” Hoore – e – Haramm ). This information is copied from the text from Filmfare magazine dated Sept 17, 1954 !! In all these years of our pursuit of her songs, we never knew that Geeta ji did sing a song for the talented Shafi sahab. It could be one of those films which was shelved/left incomplete. Hoor-E-Haramm seems to be name for a Muslim social film to me. A search on this name did not get any results related to a fifties film , so it is most likely that the film was never made. It will be great to know if at least the songs were recorded and released. Geeta ji also sang for him for the film Hulchul (a trio of Geeta ji, Meena Kapoor ji and Mubarak Begum ji – Mile Dil Aankh Sharmaayi) and sang two solo songs for Mohabbat Ki Jeet (1960). Till date we had never heard any of these songs. Film – Mohabbat Ki Jeet-1960. This entry was posted on Friday, February 1st, 2013 at 2:32 am and is filed under Geeta Dutt and her life, Geeta Dutt and her singing. You can follow any responses to this entry through the RSS 2.0 feed. You can leave a response, or trackback from your own site. difficulty, it could not be copied here so.